Maptek™ is a global provider of innovative software, hardware and services, offering a unique combination of mining domain knowledge, technical and engineering expertise and R&D capability. We are leaders in mining connectivity and automated workflows and apply optimised algorithms and predictive analysis to collect, analyse and circulate critical information, creating solutions to drive sustainable shareholder value. Maptek specialises in developing powerful and connected solutions to help mining operations better understand and transform their data into decision-ready information. We proactively integrate and use data connections to build more robust systems which span life-of-mine solutions and overcome systemic challenges. Operations require efficient access to broad datasets to assemble a single source of truth for managing integrated mine performance. Collecting data, automated if possible, from every operating device and making this accessible to all planning and operational teams is the key to continuous improvement in performance and productivity. Our aggressive development philosophy seeks to unlock and apply the most advanced technology to collect, analyse and circulate critical information to enable mining operations to achieve KPIs. Maptek delivers solutions that make use of all available information in an Internet of Things approach across platforms to maximise efficiencies. By exploiting mining data recorded by equipment, processes and systems, and communicating information around them in real time, we can replace ‘graveyard technology’, enabling planners to develop and evaluate designs which are economically viable and optimise the value of the extracted resource. Maptek has a solid foundation of 40 years in commercialising products with proven value-in-use and is relied on to guide the industry in how to gain maximum benefit from technological advances. Reliable hardware and software systems offer auditability, confidence, safety, mobility and flexibility. Operations can trust Maptek to implement robust practical solutions to specific issues as well as common industry challenges. If an application does not exist, Maptek has the expertise and vision to develop tools to answer the needs of end-users and senior decision makers. We work closely with top-tier mining companies around the world, developing and implementing innovative life-of-mine solutions that allow miners to plan operations productively, regardless of market fluctuations. Maptek products are made for mining, grounded in a deep technical understanding of mining variables. 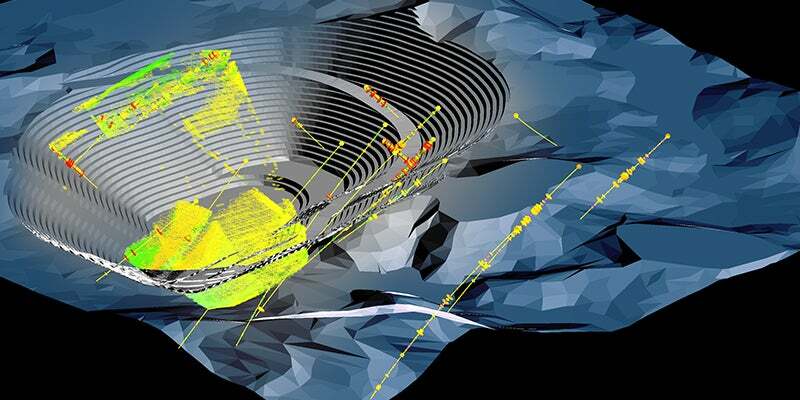 We provide a purpose-built 3D visualisation environment for intelligent interpretation of data across geological modelling, mine design, planning, production management and reporting. We build smart applications with intuitive interfaces, automated workflows, customised scripting and optimised algorithms. This saves significant effort, allowing time for detailed analysis of alternative scenarios which lead to the best outcomes. The Maptek technology roadmap is driven by industry imperatives such as connectivity and intelligent optimisation. We set the direction for individual application capabilities alongside strategic plans for leveraging the latest technology to create an integrated, secure and flexible technical user environment that facilitates sustainable growth in resource recovery. Maptek continually looks to create value by examining how data collection and analysis can extend across processes and beyond horizons. R&D into disruptive applications is supplemented by adapting existing technology to target new solutions. Vulcan™ software provides advanced 3D spatial information, modelling, visualisation and analysis. More than 10,000 licences of Vulcan are installed around the world, supporting exploration, mine design and scheduling, and mine rehabilitation across all types of resources and operations. I-Site™ 3D laser survey technology combines long-range laser scanning hardware with the best point cloud modelling and analysis software in the industry. Easy setup, portability, rapid and safe data acquisition, and powerful, in-built processing and modelling tools are hallmarks of I-Site spatial technology and workflows. BlastLogic™ is an enterprise blast accuracy management system focusing on the routine blast design, storage, traceability and task management of open cut operations. BlastLogic delivers immediate access to disparate drill and blast data, enabling easy analysis of historical performance to enhance blast accuracy, mineral recovery and downstream processes. Evolution is a strategic and tactical mine planning tool for open cut scheduling and optimisation. It produces medium, long-term and strategic life of mine schedules which reduce operating costs and maximise the value of a deposit. Evolution is an enterprise level scheduling solution which also optimises the haulage fleet and waste landforms to deliver cost savings early in the schedule. Sentry is a flexible and cost-effective solution for monitoring and risk management through analysis of movement and trends. The transportable laser-based system includes advanced software to record and monitor surface movements, helping identify trends that can lead to potential slope and surface failures. PerfectDig™ is an easy-to-use system for rapidly evaluating and supporting design conformance. The SaaS approach allows all stakeholders to quickly compare as-builts with designs in the field and fosters real-time decision making. The outcome is an efficient allocation of resources and improved wall stability and safety. Eureka™ provides a single integrated platform for viewing and analysing project drill hole and other spatial data. Eureka takes spatially located data and puts it into context to better understand the relationships between the disparate information. MineSuite systems harness the power of KPI reporting to help operations manage resources at an enterprise level, providing a holistic view of equipment, tasks, shift and personnel requirements and availability for effective planning. Maptek employs 350 staff worldwide in 13 offices, providing local services to support mining customers. We can evaluate software techniques and recommend ideal workflows using the latest tools to boost efficiency. Maptek technical support, training and consulting services help operations improve performance, productivity and profitability. Maptek is committed to providing solutions across the entire mining value chain. Please submit the enquiry form below to let us know how we can help your operation. In an industry first, Maptek and PETRA Data Science have established a partnership, which will enable seamless value chain optimisation and simulation from resource models through to metal produced. Award-winning paper 'Breaking the Billion Variable Barrier in Real-World Optimization Using a Customized Evolutionary Algorithm' by Maptek's Christie Myburgh and Professor Kalyanmoy Deb of Michigan State University outlines a new evolutionary computation that scales to handle even the most difficult problems. Mining's most advanced drill and blast system, Maptek BlastLogic, lowers risk and provides better results and greater productivity. Maptek Evolution is a fully featured open-pit scheduling solution, which delivers practical, high-value schedules. I-Site 3D laser survey technology combines rugged long-range laser scanning hardware and powerful modelling and analysis software with a streamlined survey workflow. I-Site laser scanning systems are safe, accurate and reliable. Maptek Sentry and PerfectDig systems add value to I-Site laser scanning by providing surface monitoring and design conformance solutions. Vulcan plays a critical role in the mining process, from exploration and geological modelling through mine design and scheduling to rehabilitation. New and enhanced features in Maptek Vulcan 11 target the productivity and efficiency gains that operations desire as mining activity ramps up. A collaborative partnership with LlamaZOO will deliver advanced data visualisation in 3D and VR to mining customers. A high-grade gold deposit in Western Australia relies on Maptek Evolution Cloud-based technology to solve scheduling challenges. Maptek BlastLogic provides advanced reporting around drill and blast, allowing operations to benchmark the process for identifying and realising areas for improvement. The Klondex Mines underground gold-silver mine uses Maptek™ Vulcan™ to optimise various stages of their operation. Whether for general underground survey or detailed geological face mapping, few understand the mine survey challenge such as Maptek. Which is why the new Maptek I-Site SR3 600m-range laser scanner is destined to become the mine measurement standard for underground operations. The Maptek summer internship programme has given a group of aspiring software engineers experience operating in professional teams, working with different code bases and finding solutions to real-world challenges. Maptek I‑Site technology has been instrumental in providing accurate and efficient survey deliverables across the Savage River iron ore operation. A new strategic panel caving product developed by Maptek™ targets the most cost-effective underground mining method in a transparent, analytical way while maximising productivity.